Kenya is one of the more prosperous countries in Africa, and in the capital of Nairobi business is growing at high speed. Nairobi is the most prominent city of East Africa and the hub of the entire region. For African standards, it has a very good infrastructure. Since 1994, the country’s economy has been growing each year, with the exception of 2000. Economic growth figures grew to 5.7% in 2005 and 6.1% in 2006. The skyline of Nairobi is filling up with skyscrapers and office buildings. Currently, Nairobi Business Park is being built, a flagship complex with office space for companies. When finished, it should offer 30,000 square metres of office space. However, inflation is relatively high with 10.3% in 2005 and even 14.6% in 2006, and the huge gap between the poor masses and the rich upper class remains. Half of the population lives on less than S1 a day, while a small group of Kenyans is extremely rich, often through corruption and favouritism. Corruption still plagues the country. The biggest Nairobi business in terms of foreign income, is unquestionably tourism. It brings in around U$1 billion a year. With a safari park outside the city, and dozens more within a few days drive, Nairobi is the place to go for a safari holiday. With a major international airport, Nairobi has become the tourist gateway for all of Kenya. The main railway goes through the city, and the national network of roads also. Kenya is the largest exporter of tea in the world. Tea is grown on more than 110,000 hectares of land. It’s also the 17th largest exporter of coffee. Much of the coffee is grown on farms around Nairobi. Kenyan coffee is bought and sold at the Nairobi Coffee Exchange every Tuesday of the week. The weekly tea auction takes place in the port city of Mombasa. Several major world-wide companies have regional headquarters as well as manufacturing plants in or near Nairobi. Names you will see include Goodyear, Siemens, Coca-Cola, Citibank, General Electric, Toyota and even internet giant Google. As corporations expand beyond the North American market, they are finding that a presence in East Africa can open up whole new opportunities. Nairobi has the modern facilities that major businesses are looking for. 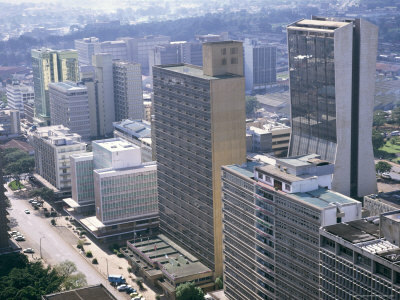 Nairobi is home to several international organisations. One of the four huge international headquarters of the United Nations is located in Nairobi. Large African companies have a strong presence in the Nairobi business area as well. Kenya Airways operates out of Jomo Kenyatta International Airport, and the Kenya Electricity Generating Company (KenGen) also has its headquarters in Nairobi. With more and more business taking place in Nairobi, there are plenty of facilities to accommodate a business trip. Major hotels like the Nairobi Serena or Hilton Nairobi have extra services for business travellers, such as meeting rooms, internet and fax services and even a secretarial staff. You'll find that many high-class hotels are located in the business district. The Kenyatta International Conference Centre, located in the heart of the business district, has all the facilities needed for major business meetings, exhibitions and conferences. The amphitheatre can hold up to 800 people, and the huge main chamber can sit up to 5,000 attendees. The sound systems are state-of-the-art, including wireless simultaneous interpretation services that can translate into 7 languages, for international events. The business district is also home to the City Hall and Parliament buildings. Uhuru and Central parks add a natural green element to the area. Some parts of the city are growing so fast with regards to business facilities, that offices are starting to move out of the business district to other parts of the city. There is a great deal of commercial growth going on. The local stock exchange was established in the 1920 when Kenya was still under British rule. In 1954, the London Stock Exchange recognized the NSE as an overseas stock exchange and today it is the 4th largest exchange in Africa. There are nearly 50 companies listed on the exchange, as well as Government of Kenya treasury bonds. Nearly every possible industry or business sector can be found represented in Nairobi. Business in technology, agriculture, finance, retail, manufacturing, travel and many more are t in this busy African capital.